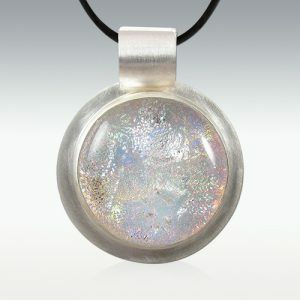 Dichroic glass jewelry pendants is a very special way in remembrance of your beloved pet. 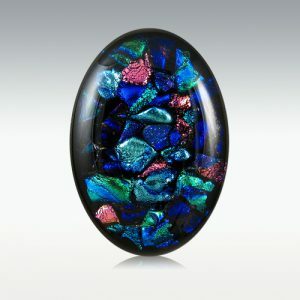 There is a growing trend on dichroic glass memory pendant jewelry and its beauty. This beautiful glass displays a color change in certain lighting and the view of the angle making this a amazing piece to wear. With these gorgeous memory pendants, your pets ashes are fused between layers of glass. Your pendant will have 3 layers of glass: Bottom layer is a black glass with an iridized back, the middle layer is made up of several pieces of different colored of dichroic glass of your choice, the top layer being a cap of clear glass. 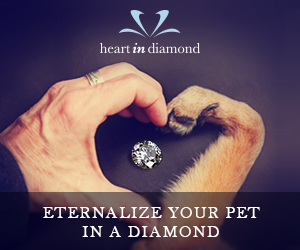 Your pets ashes are fused between the bottom layer and the dichroic glass layer. You have your choice of different color options to choose from truly making this one of a kind…. Choose from 3 different shapes, round, square or rectangle. Glass colors and patterns will vary. With this pendant you have options to choose from different colors, blues, purples, greens, reds, gold, pinks, oranges and autumn color. Includes a nice quality black imitation leather neck cord ,which comes in 5 different lengths you can choose from, 16″, 18″, 20″, 22″ or 24″. 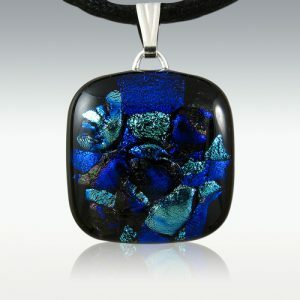 This pendant is made from sterling silver and dichroic glass. This color (opal) pendant only comes in round shape. If you like the sterling silver and dichroic glass together they do come in different shapes and color choices. 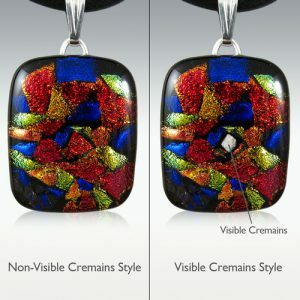 Only with the sterling silver and dichroic glass pendants you have your options to choose of your pets ashes or hair. Your memory pendant comes with a black neck cord. This worry stone oval Dichroic Glass memorial is made from dichroic a small amount of your pets ashes are fused between layers of glass. As mentioned above your memorial stone like the pendants above will have 3 layers of glass: Bottom layer is a black glass with an iridized back, the middle layer is made up of several pieces of different colored of dichroic glass of your choice, the top layer being a cap of clear glass. Your pets ashes are fused between the bottom layer and the dichroic glass layer. With this worry stone you have options to choose from different colors, blues, purples, greens, reds, gold, pinks, oranges and autumn color. These beautiful dichroic glass jewelry pendants are a special way to share the memory of you furry friend. I personally like the dichroic pendant with all the color options to choose from, I love color in my life. For some of you who don’t want all that color the perfect choice for you would be the sterling silver opal pendant. Some people don’t like all that color or you want something that will go with your everyday wardrobe. If you don’t want to wear a memorial pendant then the worry stone would be a perfect option for you, this can be displayed on your desk as a decorative piece. I think whatever you decide on you can’t go wrong they are beautiful. Yes, these memorials make great gifts as well. If you need any help please let me know. I wish I know of this pendant when my dog passed away a decade ago. It will be a great way to keep her memory. She was a fun dog. Always cheerful. I never get another dog after her.